We can ship your luggage and vacation gear ahead to your hotel, golf course, or resort. No more hauling your bags around the Lubbock or Dallas airports. 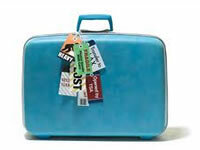 We can also provide return labels so that your luggage can be shipped back home. It is easy, convenient, and secure. Pak Mail of Plainview takes the "lug" out of luggage!